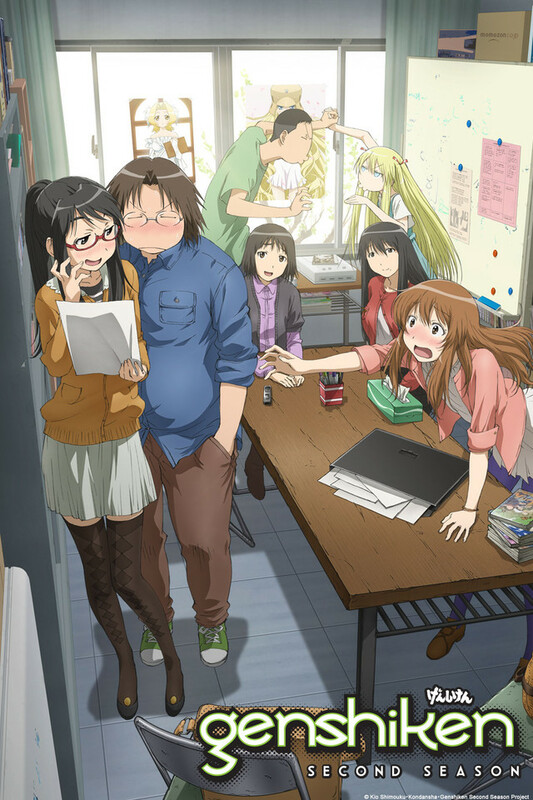 It’s a new year, and the members of the original generation of Genshiken are no longer in school, having moved on with their lives. Ogiue, no longer as reluctant a fujoshi (fangirl) as she used to be, is now the president of the club, with the cosplaying Ohno still hanging around, as well as Kuchiki, the hyper, blurting otaku last seen expelling some of his limitless hot air. After the previous year’s failure at the club fair, Ogiue has a plan to draw in new members—she’s making a large drawing, the size of a standard bulletin board, in real time. It certainly draws a crowd, and out of that crowd come three interested students— all female, or at least that’s how they present. One of them is not as she appears, and it’s that member’s safety that is foremost in the minds of Ogiue and Ohno… but that doesn’t mean they won’t have some fun making the old members guess which one isn’t physically a girl. Genshiken: 2nd Generation doesn’t miss a beat. The running commentary on the events in the show is back, and so is the relatability of the new characters to the viewer. I won’t say that everyone knows someone like these girls, but in my personal journey through college and whatever corners of the internet I occupy, I certainly have. You either know them, have observed them at cons and clubs, or have heard tales of them, and I’m here to tell you that those tales (and the caricatures in this show) are no exaggeration. That mix, that “realistic caricature,” is what makes Genshiken always worth watching. I’m also impressed by the sensitivity this season starts off bringing to the issues of being transgendered. The respect and care given by Ogiue and Ohno is notable, and the blunt confusion of another of the new members about the issue will hopefully provide a bit of a teachable opportunity down the road. Even if it doesn’t, I know plenty of people who aren’t terribly sensitive to the subject in real life, so there’s another point of realistic caricature for you. As a fan of Genshiken since I saw a cat-eared Kasukabe cosplayer whirling a broom over her head (fans of the original series will remember this moment, hopefully!) in tandem with what was playing on the screen in an Otakon viewing room back in 2005, the start of this new season takes me back to that moment and so many in between, reminding me of the universality of the otaku experience and just how small this society we dedicate ourselves to really is.